Soothe and stimulate sore, aching muscles with the SpaBuddy Sport. 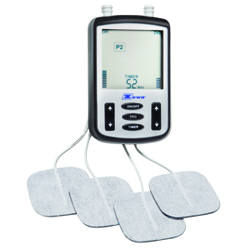 Electromassage therapy machines (also called TENS) have been used for decades by physical therapists to relieve chronic and acute pain as well as sore and aching muscles. Now you can use the same technology used by physical therapists easily and safely in the comfort of your own home. Simply place the electrodes on top or around the area causing you the most pain, select 1 of 8 programs and turn up the intensity, it's that easy. Features 8 programs, 30 intensity levels, 5 - 95 min. timer and a button lock feature to protect the device from accidential changes. 8 pre-set TENS Programs provide different treatment options. Count Down Timer indicates when device will turn off. Set between 5 - 95 minutes or continuous. 2 Independent Channels offer the flexibility to use 2 or 4 electrodes on different body locations. Button Lock Feature locks all buttons to avoid accidential setting changes. 30 Intensity Levels make it simple and quick to individually adjust each channel's strength. Detailed explanation of each of the 8 programs including what benefits each program provides and what you will feel. Recommendations on how and where to place the 2"x2" electrodes. Recommendations on how and where to place the butterfly electrodes.